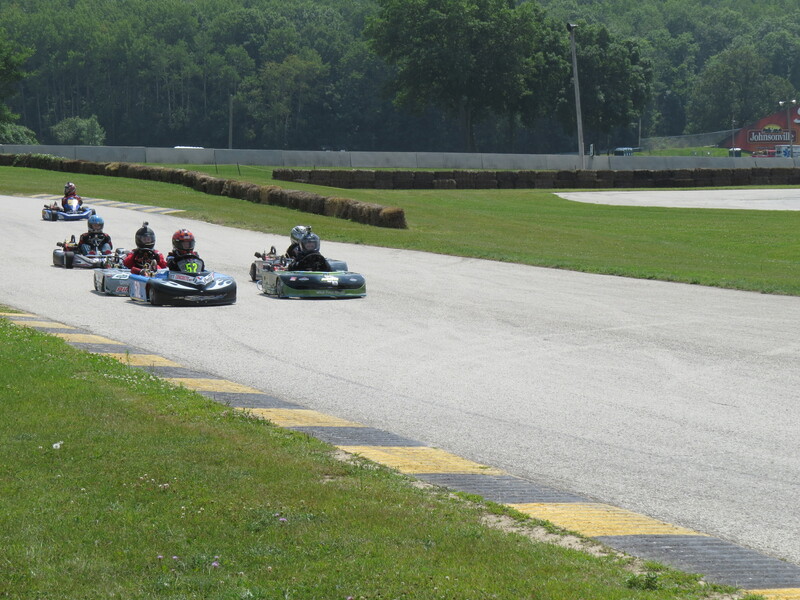 The week’s race was at our old kid kart racing ground, Road America. We needed to get more seat time here to get the kart tuned up for the last Mid-American Sprint Series race in a few weeks. Road America has a very nice track with a long front straight, followed by a run up hill (50ft elevation change), a switchback downhill with off camber turns, and an oval or monza turn just before the finish, depending on the configuration. With some more practice and tuning wanted to get him and the kart ready to run with the fast kids. Jason started heat 1 on the outside of the first row with Sarah (#52) on the pole, Riley (#91) in 3, Randy (#23) in 4 and a new racer Ryan (#4) bringing up rear. This is a pretty good spot for him. If he times the start right, he has a good shot at getting the lead and that is exactly what happened. He timed it just right and was past Sarah before the first corner and heading up the hill. He held that spot and pulled away for 3 laps until Randy finally got around Sarah and then picked Jason off at on the corner at the bottom of the hill. Not a bad start to the race day. The field order was reversed for Heat 2 which placed Jason in the #4 spot. Ryan opted to start at the rear. This was going to be a tricky start and he was going to need to be on his toes to move up. Luckily, Riley got a good jump on the start and gave Jason room to move into 3rd while Randy smoothly pulled into second. Randy and Riley pulled away but Jason was able to catch them again at the kink on the way uphill as Randy passed Riley. Jason almost made a pass on Riley as they rounded the top and started their way down. During practice, Jason had been passing Riley just before the kink as they zipped up the hill. For three laps, he worked on passing her. He got a little closer every time, until he completed the pass on the last lap. He pulled away, racing to the finish for second. With his excellent finishes in the two heats Jason started in the second position with Randy on the pole. At the drop of the green flag he shot to the front with Randy hot on his heels. Unfortunately, his lead did not last long and Randy passed him at the bottom of the hill again. From then on Randy pulled away from Jason and Jason pulled away from the rest of the field. In the end Jason finished in second. There is still a lot of work to do to get this track down but progress has been made compared to the last time we were here. Jason’s next race is at BlackHawk Farms Raceway in South Beloit, IL with the Championship Enduro Series. Thanks to my parents who came out to visit us at the track and cheer on Jason, The Road America Kart Club for putting on a great show. To all of our race friends. Karen who makes sure he has other things to do like football. Karen would also like to thank the RAKC for using Race Monitor, so that she can keep an eye on her boy. Jason, you get out there and SLAY THEM!! You are fulfilling all my fantasies of being a race car driver with a eggplant Bugatti.